When Christine, from Silverlinings 4 me, asked me to participate in this week's wordweek for the word "abundance", all I could think of was the abundance of house projects that need to be done at Love and Life at Leadora! However, I quickly realized that all these house projects would not make very interesting nor pretty photos! 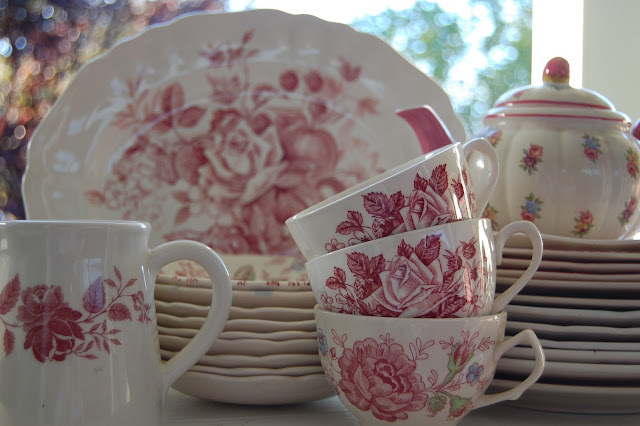 So instead, I decided to share my abundance of pink and white dishes. The dishes in the photo are only a small portion of what I own. I love china and would probably have as much possible if it weren't for lack of money and space! Have a wonderful weekend! Dishes make me happy too, and yours are lovely. I'm a dish-aholic. Every time I go to the Allegan Antique market I come home with more dishes. What a lovely picture. So pretty. You already know how much I like dishes...and pink and white is one of my most favorite patterns. (-: What a pretty picture! What a pretty china collection you have...I especially like the rose transferware...I've been looking for something similar every where. Where did you find yours? Love, love, love it. Have a wonderful weekend. Those are gorgeous! I love china too - my 'things' are cups and saucers and blue and white china for my kitchen. And vintage Portmerion. And pretty bowls. And cute little jugs. I wonder if I could find an excuse to collect pink and white? It's just so pretty! I've always been attracted to these colors! the delicate pattern matches your size & personality! do you mix these plates with others? the teapot is adorable! the teapot is my favorite. My name is Katy and I'm addicted to china. My more prudent other half has to keep a sharp eye on me in shops! Your photo is just the sort of display which would have me trying out my most persuasive puppy dog eyes! Gorgeous dishes :) I've never been a china collector, but I just love wandering through looking at old plateware at the antique shops and thinking of who might have used it last. Lovely!